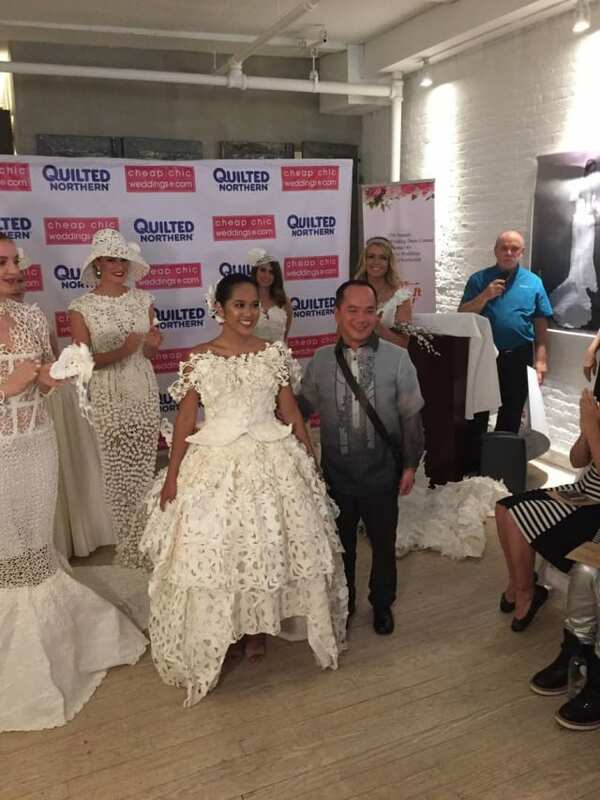 Each year, TP brand Quilted Northern partners with Cheap Chic Weddings, a blog for brides on a budget, and invites designers to create their best wedding dress out of toilet paper alone, and this year's finalists are truly unbelievable. Let's take a look, shall we? 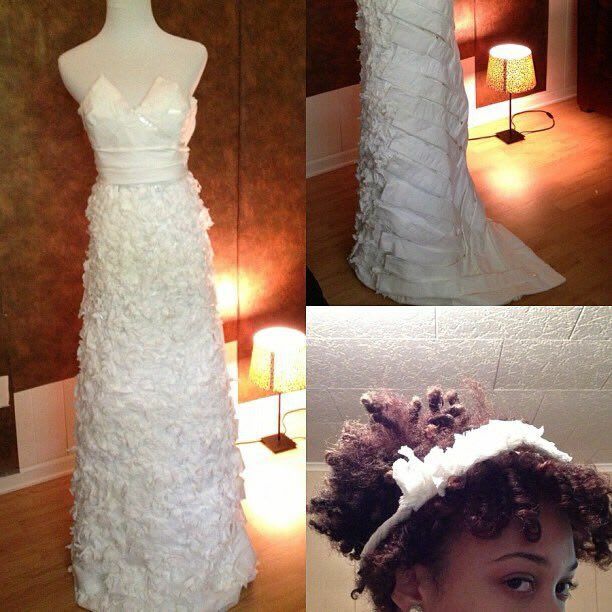 Submitted by Lindsay Hinz This toilet paper wedding dress is a dream ballgown with a unique turtleneck, cutouts, a sweetheart neckline and structured cap sleeves. Not to mention a voluminous skirt that would float through any princess's dreams! This stunning wedding creation was actually submitted by 2016's grand prize winner, Van Tran, and features a fairytale floral netted skirt and bodice overlaying a sleek modern pantsuit, giving off some seriously charming vibes. This 60s-inspired gown was submitted by Susan Masarek Wilson and features a high neckline, a pillbox hat, and a full cape. Toilet paper or no, we have a feeling Jackie O would have felt right at home in this dress. This sharp sweetheart neckline gown features a chevron pleated bodice and back and a matching headband, but the real star of this gown is the front of the skirt, which features tons of textured floral detail. 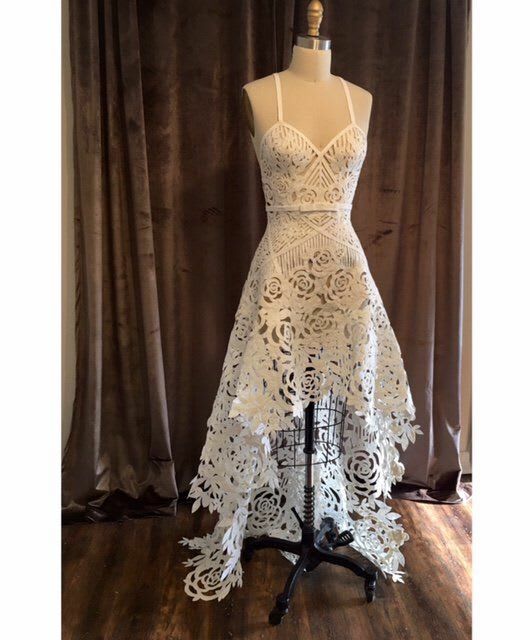 This unbelievable sheer gown submitted by Ashley Ulcini Cobb features geometric and rose cutouts throughout and rides the trend of high-low skirts flawlessly. The sharp bow belt detail at the front of the dress only adds to its uber-detailed perfection. 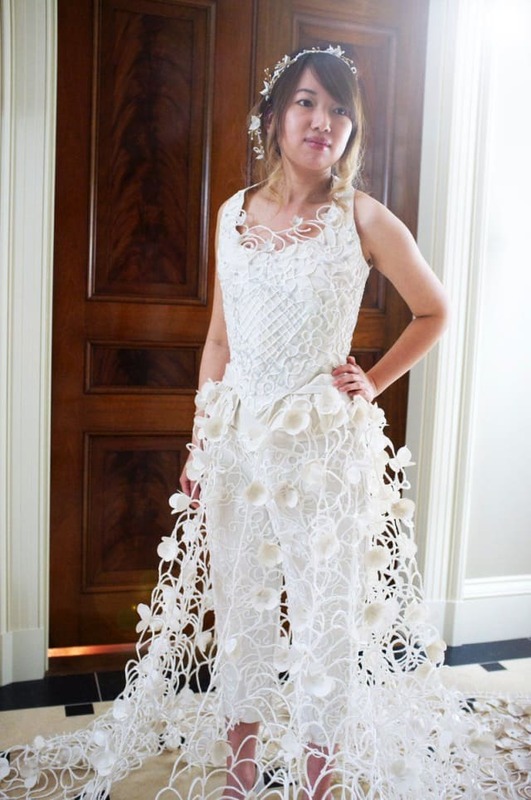 This sheer gown by Mimoza Haska nets hundreds of toilet paper flowers to create a floral dress worth drooling over (just not literally, because, you know, the toilet paper won't hold up.) The matching hat goes the extra mile to give this sheath added retro flair. Carol Touchstone created this one-of-a-kind 1920s-inspired gown with a matching hat. This tassel-covered drop-waist gown also features a stunning neckline with unique cutouts that make it a perfect match for the modern bride. This 70s-vibe August Manzanares gown is covered in floral netting detail and features a meticulously crafted sheer bodice and sleeves with a solid skirt that flares out in true trumpet style at the bottom. 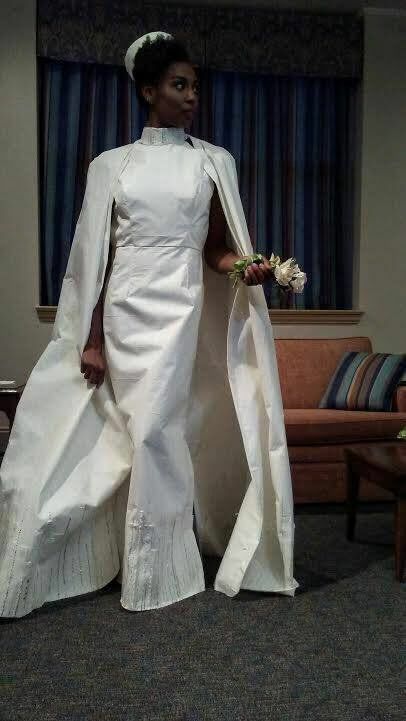 Roy Cruz submitted this unique tea-length high-low gown that combines modern design with traditional Latin-American flare using dozens of layers of toilet paper. Susan Brennan submitted this stunning toilet paper gown, with a surprisingly sturdy and thick quilted skirt. The added texture brings a beautiful richness to gown that is matched only by its floral neckline and matching birdcage veil. 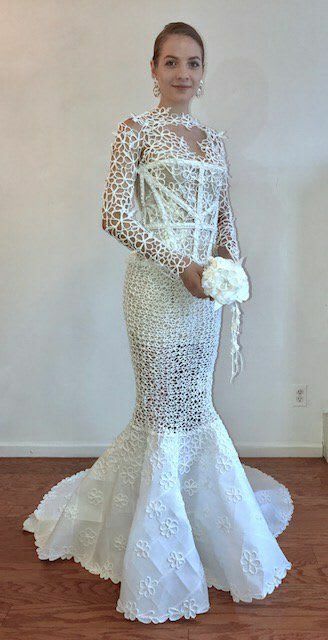 This gown, the winner of the 2017 Toilet Paper Wedding Dress Contest, features fairy-tale netting all over, including a stunning back and unbelievably detailed toilet paper embroidery details. Leaves are used in multiple areas to give a natural wonder to the gown and it includes an enormous train made entirely of toilet paper butterflies. It's easy to see how this stunner took the grand prize. 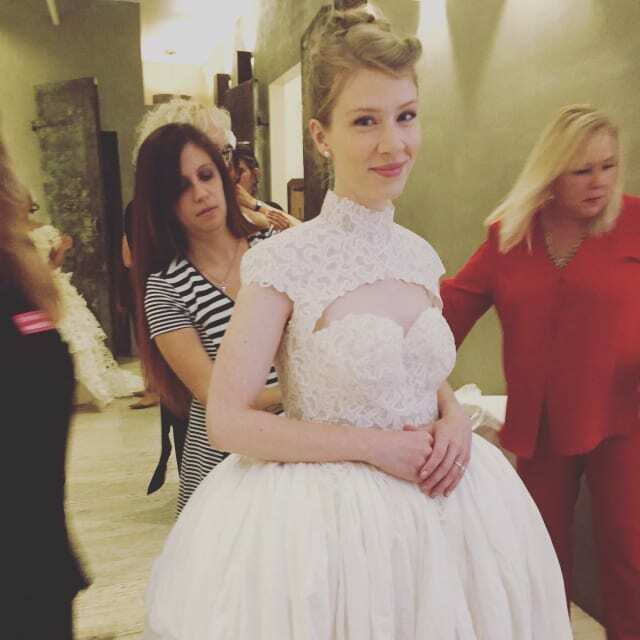 Would you wear any of these TP wedding dresses on your big day? Talk to us about it in the comments below, and share with your friends to see what they think!